When you format P2 Card and lost all data stored on P2 Card, How to recover them? If you have saved files from a P2 card onto a HD, and they were deleted. Is it possible to recover P2 video files? Which Data Recovery Software is the best P2 Card Recovery? P2 (P2 is a short form for “Professional Plug-In”) is a professional digital recording solid-state memory storage media format introduced by Panasonic in 2004, and especially tailored to electronic news-gathering (ENG) applications. It features tapeless (non-linear) recording of DV, DVCPRO, DVCPRO25, DVCPRO50, DVCPRO-HD, or AVC-Intra streams on a solid-state flash memory. P2 cards offers comparable recording capacity to tape-based media, and disc-based media, but with the added advantage of no moving parts. The P2 card is made up of a series of SD cards, depending on the capacity. Resistant to impact and vibration, shock, dust, and environmental extremes (including temperature changes), the P2 solid-state memory card can transfer data at high speeds without worry about its dependability. Panasonic AJ-HPX3700, AJ-HPX2700, AJ-HPX3100, Panasonic AJ-HPX3000, AJ-HPX2100, Panasonic AJ-HPX2000, Panasonic AG-HPX600, AJ-HPX500, AG-HPX555, AG-HPX371, Panasonic AG-HPX370, AG-HPX300, AG-HPX250, AG-HVX201, AG-HPX171, AG-AF101, AG-AC160EJ, AG-AC130EJ, AG-HMC81, AG-HMC151, AG-HMC41, AG-AF100, AG-HVX200A, AG-HMC40PJ, AG-HCK10G, Panasonic AJ-HPM200 , Panasonic AJ-HPM100, etc. Files like photos, videos(.mxf) and audios on P2 card may become inaccessible due to unintentional deletion, unexpected formatting, sudden power off, and so forth. To get back p2 card data, you need a great P2 Card Recovery tool. 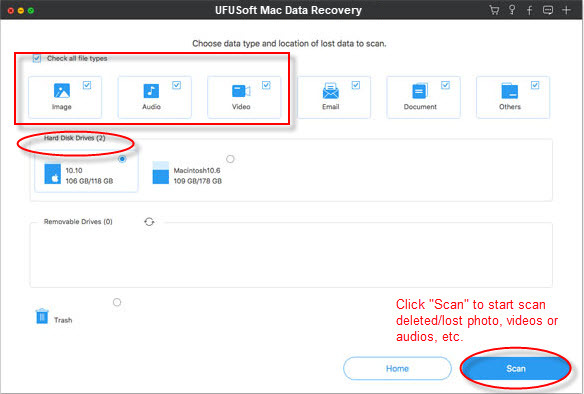 UFUSoft Mac P2 Card Recovery software tool lets you recover all your lost, deleted, formatted and inaccessible photos, videos and music files from your Mac or other storage device like P2 card, XF card, SD card, etc. It provides complete data recovery from any Mac-based hard drive, iPod, USB drive, external hard drive, digital camera and other storage media. With an easy-to-use interface, even novice users can recover files from Panasonic P2 card on Mac with great ease with just a few mouse clicks. How to Recover Data/Files from Panasonic P2 Card on Mac? Step 1. Download the free trial version of UFUSoft Mac P2 Card Recovery, install and run it. Step 2. Connect your Panasonic P2 card to the Mac. Step 3. From the drive list, select the P2 card and click “Start Scan” to search for lost data. Step 4. After scanning, all files found will be listed. Mark the ones you need to get back and click “Recover” to recover photos, videos, and audios from Panasonic P2 card on Mac.